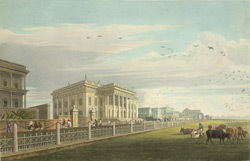 This is plate 11 from James Baillie Fraser's 'Views of Calcutta and its Environs'. Fraser (1783-1856) arrived in Calcutta in 1814 and in six years produced these animated sketches of the busy city, published later as a collection of twenty-four superbly aquatinted plates. Fraser wrote: "The Old Court House in Tank Square had been used as a place of public entertainment, but its demolition in 1792 left Calcutta without any grand halls for public suppers or dances. It was resolved to in February 1804 to erect a Town Hall for this purpose, and a lottery was proposed to raise the money. It was apparently already designed (by Colonel John Garstin of the Engineers) before Wellesley left Calcutta in 1805, but it was not completed until 1813 under Lord Minto."